In light of my last post concerning the use of the DC or Hybrid concept for electrical power, it occurred to me that the system could also have used monobloc AGM/Gel batteries or indeed a bank of long life 2 volt gel cells. In that case why was Lithium chosen? Hopefully this post may go some way to highlighting that decision process. Across all markets over recent years Lithium-ion batteries have been gaining in traction [sic]. To the uninitiated it is easy to dismiss Lithium-ion as an expensive alternative to VRLA (valve regulated lead acid) technologies such as AGM (absorbed glass mat), if simply looking at the amp-hour (Ah) rating. This was the initial mistake I made a few years back. Digging deeper it became clear to me that there is a lot more than Ah ratings to consider, when choosing the best batteries for your application. In the marine world (which is where I have the most experience) the choice these days and especially with higher loads – often simply comes down to Lithium-ion vs AGM. In the comparisons below whilst Gel batteries are shown, they do have a lower effective capacity at high discharge currents. They cost about the same as AGMs, assuming both types are monoblocs, as opposed to 2 V long life gel cells. Wet cell or flooded lead acid (FLA) batteries whilst referred to are not considered for the crux of this particular comparison, primarily due to maintenance and safety considerations in the marine environment. This of course may not apply to other markets. It is generally accepted that the most economic and practical depth of discharge (DOD) for an AGM battery is 50%. For Lithium-iron-phosphate (LiFePO4 or LFP) which is the safest of the mainstream Li-ion battery types, 80% DOD is used. The nominal voltage of the LFP cell is 3.3 V. This 26.4 V LFP battery consists of 8 cells connected in series with a 180 Ah rating. The available energy is 26.4 x 180 = 4. 75 kWh. Useable energy is 26.4 x 180 x 0.80 = 3.8 kWh. The nominal voltage of the lead-acid cell is 2.0 V/cell. Each 12 V monobloc battery consists of 6 cells connected in series with a 220 Ah rating. Connecting 2 x 12 V 220 Ah batteries in series to give 24V and 220 Ah, the available energy is 24.0 x 220 = 5.28 kWh. Useable energy is 24 x 220 x 0.50 = 2.64 kWh. This begs the question, what Ah rating of AGM batteries would be the equivalent of the 3.8 kWh useable energy of the Lithium-ion battery? To get 3.8 kWh of useable energy from an AGM battery it would need to be twice that size to start with due to the 50% DOD economy rule i.e. 3.8 x 2 = 7.6 kWh. At 24V that would mean 7,600/24 which gives us a battery rating of 316.66 Ah, which is moving closer to twice the rated capacity of the Lithium-ion 24 V 180 Ah. Note this does not take into account, the ageing of the batteries, temperature derating or the effect of higher loads. For AGM batteries, higher loads have a greater effect than on Lithium. 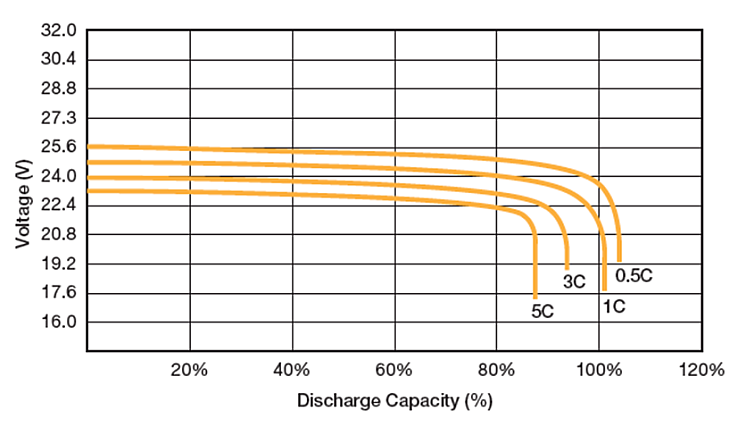 See the section – Useable energy: effect on discharge capacity and voltage with differing loads, below. Based on all this it is reasonable to say that an AGM battery will need to be twice the Ah rating of a Lithium one. What about price? Using the Victron price list we see that a 12V 220 Ah AGM is € 470 ex VAT or 2.136 €/ Ah. For 316.66 Ah that is the equivalent of € 676.50 at 12V or € 1,353 at 24 V. The 24V 180 Ah Lithium is € 4,704 for the same amount of useable energy and is therefore 4,704/1,353 = 3.48 times more expensive (or less if we consider the factor of 2 referred to above) when comparing Ah ratings. Based on this you might immediately conclude that Lithium is not cost effective, however useable energy compared to price is only part of the story. Most Ah ratings of batteries regardless of type are specified at the 20 hour rate. This was fine in the days of light loads, but as the number of loads and the size of loads has increased over time, we also need to look at high short term loads, medium and longer term ones for differing types of equipment. This can mean a large battery pack. At the extremes we might have air conditioning running for 10 hours using 10 kW, compared to an LED light using 100 Watts in that time. Balancing these differing requirements and all the loads inbetween becomes key. With a large pack as shown below to achieve this, it becomes clear just how heavy Lead Acid can be compared to Lithium. 1360/336 = 4 times heavier. As stated earlier most batteries Ah rating are quoted at the 20 hr rate. In the image below for the lead acid battery, if that were a 100 Ah battery at the 20 hr rate, you can see that 0.05C means 100 x 0.05 = 5 Amps for 20 hours = 100 Ah available until the battery is totally flat. As we use only 50% of the battery we can see that the voltage will still be 24 V at 50% DOD for a 5 Amp load over 10 hours, and therefore we would have consumed 50 Ah. Increasing the current draw (as the graphs below show) can affect the useable energy available and battery voltage. This effective shrinkage in the rating is known as Peukert’s effect. With lead acid the higher the load, the more you need to increase the Ah capacity of your battery to help alleviate this. With Lithium however a load of even 10 times greater at 0.5C can still have a terminal voltage of 24V at 80% DOD/20% SOC, without going up on the Ah rating of the battery. This is what makes Lithium particularly suitable for high loads. 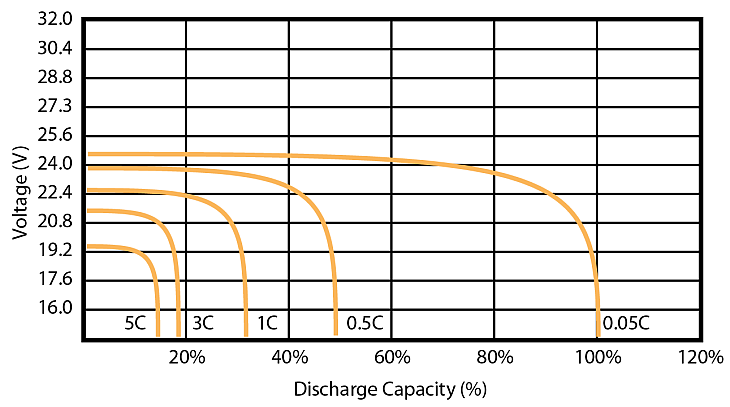 Note: In the graphs below Discharge Capacity vs Terminal Voltage is shown. Usually you will see AGM graphs as Discharge Time vs Terminal Voltage. The reason we plot Discharge Capacity (instead of Discharge Time) is that Lithium has a higher and more stable terminal voltage than AGM, so plotting the curves with Discharge Capacity in mind gives a more accurate comparison of the chemistries, showing that Lithium increases useable energy at higher loads due to higher and more stable terminal voltages. Whilst you may consider this a grey area (in part too due to the varying internal resistance of batteries also) it is probably the only true way to compare the technologies. This is further demonstrated in the images below the graphs. Much that we have seen in the discharge process is also true in the converse process of charging. Don’t be put off by the large generator sizes shown below, as this blog merely shows a range of scenarios. Solutions are scalable in principal. First let’s compare charge efficiency of Lead Acid on the left to Lithium on the right, during the complete charge cycle. Charging the last 20% of a lead acid technology battery is always slow and inefficient when compared to Lithium. This is borne out in the fuel costs (or whatever charging source you use) in the images further down. Note the difference in charge times too. The recommended charge rate for large size AGM batteries is 0.2C i.e. 120A for a 600A battery consisting of paralleled 200Ah blocks. Higher charge rates will heat up the battery (temperature compensation, voltage sensing and good ventilation are absolutely needed in such a case to prevent thermal runaway), and due to internal resistance the absorption voltage will be reached when the battery is charged at only 60% or less, resulting in a longer absorption time needed to fully charge the battery. High rate charging will therefore not substantially reduce the charging time of a lead-acid technology battery. By comparison a 200Ah Lithium battery can be charged with up to 500A, however the recommended charge rate for maximum cycle life is 100A (0.5C) or less. Again this shows that in both discharge and charge that Lithium is superior. Depending how you treat a battery you can reasonably expect the range of cycles below, subject to the DOD and the battery banks being properly sized for the loads. Operating temperature also comes into play. The hotter the battery the less time it will last. Battery capacity also reduces with ambient temperature. The baseline for variations due to temperature is 25 degrees Centigrade. Clearly AGM batteries will need to be replaced more often than Lithium. It is worth bearing this in mind as this entails time, installation and transportation costs, which further negates the higher initial capital cost of Lithium as does the lower cost of recharging Lithium. No matter what battery choice you make there is also both a capital cost and technological risk at the outset. If you are in a position of having the capital for the higher upfront costs of Lithium, you might find that life is easier and that choice is a cost effective one over time. Much of this depends on the knowledge of the operator and how they treat a battery system. There is an old saying that batteries don’t die, they are killed. Good management practices are your insurance against early failure, regardless of the technology used. Lithium-ion vs AGM? The choice is yours. Personally I think the time is right to consider Lithium in the marine industry as a cost effective, reliable, high performance solution. Last week (it was only out of curiosity you understand) I went for a test drive in a Lithium-ion powered Tesla Model S – and as we know, no self-respecting electric vehicle manufacturer would still use lead acid based battery technologies today. Time for the marine industry to catch up? Thanks to Reinout Vader and Johannes Boonstra for the images and technical advice in writing this blog. Battery and MPPT Solar charge state: Bluetooth Low Energy dongle & App has arrived!